The Library has always been a steadfast entity in Irene Winters’ world. Doors to alternate worlds always function properly as long as the Librarians use them appropriately. Unfortunately, something has changed as Irene and her assistant, Kai, face danger when trying to open a Library door. The Library itself is at risk and Irene is willing to do whatever it takes to ensure the safety of the world she knows. Meanwhile, Irene’s good friend, Peregrine Vale, has been tainted by Chaos Can Irene and Kai save both the Library and Vale? 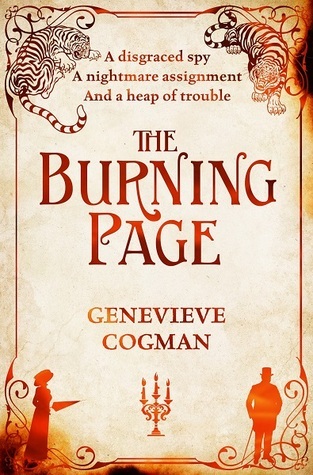 THE BURNING PAGE is the third book in Genevieve Cogman’s The Invisible Library series. I would highly suggest reading the series in order as the foundations of the character development and world building are already established. There is also an ongoing thread that truly hits its stride in THE BURNING PAGE and you don’t want to miss the full impact of this fascinating storyline! Irene is quickly becoming one of my favorite heroines! I love her quick thinking and her loyalty to her friends. Besides, she hates spiders as much as I do as Genevieve Cogman crafts one of the few spider scenes that I enjoyed despite the nasty eight legged arachnids! Sherlock Holmes happens to be one of my all-time favorite detectives so of course I adore Vale! The comparisons to Sherlock Holmes (aka “the Great Detective”) are brilliantly executed. THE BURNING PAGE puts an interesting twist on his story and I hope we get to dig deeper into things with him in future books. THE BURNING PAGE is my favorite book in The Invisible Library series and solidifies me as a fan. Genevieve Cogman has crafted an intriguing steampunk series that is both clever and action packed. Highly recommended!